What to do during monsoonal rains and severe flooding events? Simple answer – stay indoors and avoid any unnecessary travel. 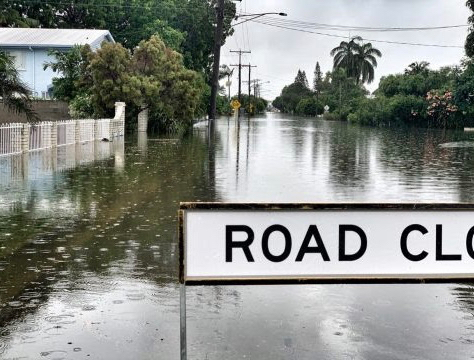 With much of the state’s north and north-west experiencing record-breaking rain and with further heavy rainfall predicted police would like to remind the public to avoid any unnecessary travel and to stay away from flood waters. During severe weather events traversing roadways, either in vehicles or on foot, is hazardous as water levels can rise and fall quickly. Flood waters are considered ‘dirty water’ and are full of hidden hazards lurking under the surface which can easily turn a ‘case of curiosity and sightseeing’ into a life-saving emergency. Not only do flood waters have deceptively fast flowing currents that can easily sweep away vehicles and people trying to wade through them, they also contain untold amounts of debris such as trees, logs, building materials and wildlife. Police are urging everyone in the affected areas to re-consider any unnecessary travel over the weekend. Stay informed and up to date with the latest weather, flood and road conditions. Avoid flooded roads, creeks and watercourses. Drive with caution and to the prevailing weather and road conditions. Slow down when travelling in heavy rain and on water affected roads. Road conditions may be difficult to assess, including water depth, water speed and debris. Remember: road closures and road conditions can change rapidly as creeks and watercourses can rise and fall quickly. Do not to ignore road closure signs as they could be protecting travellers from washouts, craters and other hazards, and not to attempt to cross flooded roads, causeways or watercourses. Do not play or enter flood-prone waterways, watercourses and drains as water levels can rise rapidly.